Aunt Clara has some very elderly friends. In light of our existence in the 21st century (and the popularity of video games) she is no longer going to speak about age in terms of years. From now on, dear reader, it will behoove all of us to refer to years of age as game levels. The game of life! I now have a friend who is just defeated level 94. Now that is an accomplishment. She also has many of her health points left. The local teens are always bragging about how many levels of some game that they have defeated, but in the game of life they are only on level 15 or 17. Not much of an accomplishment considering that so many people have defeated level 70 or even 80. And will any of these low level life gamers ever become architects or scientists? Hard to imagine when they are spending their hours playing games about killing reanimated human cannibals and racing in cars that they will never be able to afford. In Aunt Clara’s day, young boys played with Lincoln Logs, invented by the son of architect Frank Lloyd Wright, which tells you that young minds in the early 1900s were much more active. Frank’s son was using his time in creating something that would last for many generations. Children of today only create YouTube videos that are forgotten 10 minutes after they are loaded onto the world wide computer web. Lincoln Logs are notched so that logs may be laid at right angles to each other to form rectangles resembling buildings. Children who played with them were learning geometry and how to put things together. Children who play video games learn only how to destroy and annihilate. Over time Lincoln Log sets became more elaborate and led to the inventions of Tinker Toys and Erector Sets. The child who played with Lincoln Logs became the pre-teen who worked with an Erector Set, which consisted of various metal beams with regular holes for assembly using nuts and bolts. Other mechanical parts such as pulleys, gears, wheels, and small electric motors were also part of the system. 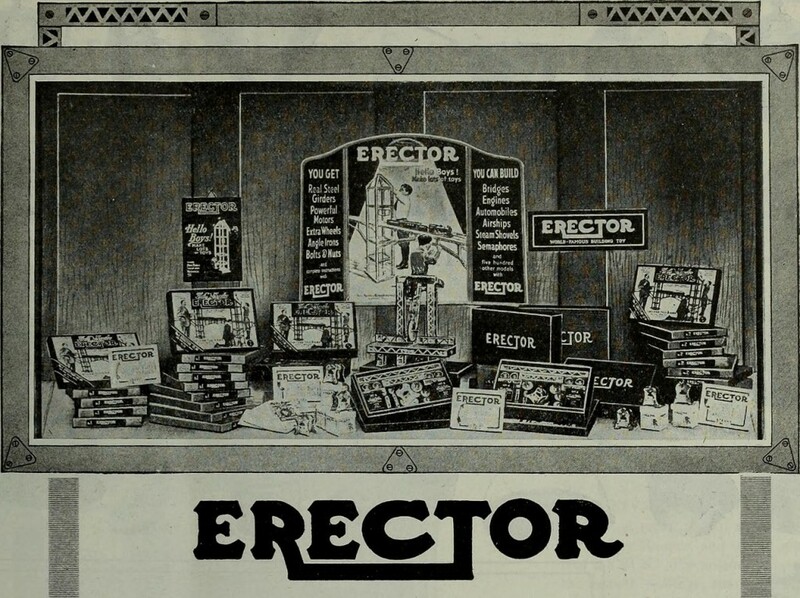 What distinguished construction sets like Erector, was the ability to build a model, then take it apart and build something else, over and over again. A child’s natural curiosity and imagination was all that was needed to build many elaborate structures using the Erector Set. Bill Sewell was one such curious boy. Having built every conceivable model using his set (and then being admitted to the Yale School of Medicine) he built the first artificial heart, which, in 1949, he used to bypass the heart of a dog for over an hour. After being chased out of Yale by the dog’s owner (who was also Bill’s anatomy and physiology professor) he went on to create the precursor to the modern artificial heart. He could not have done that playing Atari 2600 or Nintendo. Give a child a video game and they might be happy for an afternoon, let a child explore and create using Lincoln Logs and an Erector Set and that child will find lifelong happiness and one day move out of your basement.